Billings Boats BIL588 African Queen 1/12 scale ABS hull! This is the ship which gave its name to the movie starring Katherine Hepburn and Humphrey Bogart. The story takes place during World War I. The African Queen attacks the German warship “Konigin Luise” on Lake Victoria in Africa, after a long and dangerous trip down the tributaries to the lake. 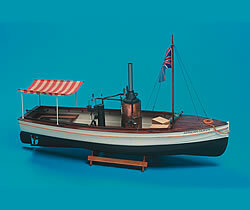 The Billing Boats model has a plastic hull and imitation steam engine.